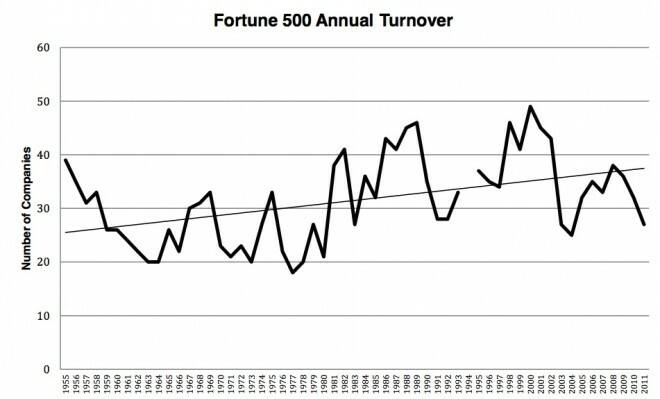 Cited and noted: What Does Fortune 500 Turnover Mean? Blog Cited and noted: What Does Fortune 500 Turnover Mean? Since 1955, the Fortune 500 list represents the 500 largest US corporations by gross revenue. Making the Fortune 500 is a mark of prestige for the company. But what got you there does not necessarily keep you there. In 10 short years almost 40% to 50% of the Fortune 500 club are no longer found on the list and in The cost of culture, a 50% turnover of the Fortune 500 I took 10-year window to note the role organization culture has to get and keep a company fit. 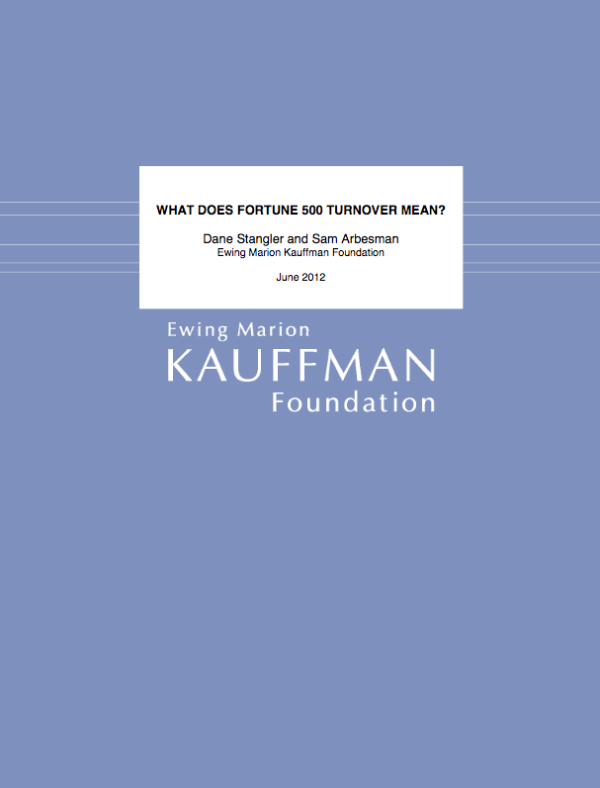 Points I made within the post became cited in the Kauffman Foundation report What Does Fortune 500 Turnover Mean? I chose to look at culture as a siren call for failure and a reason these former market-leading companies fail to maintain excellence. Where I looked at the list through 10-year increments, the authors, Dane Stangler and Samuel Arbesman, note year-over-year turnover. However, the authors, more deeply, and critically, dive into what causes turnover and if the Fortune 500 turnover is a good thing or, indeed, a bad thing. If either, why, not just what? As well as the extrapolated impact a shifting economy, sectors, and equity markets, themselves, have on Fortune churn for company appearance, disappearance, and, at times, reappearance. 1955 to 1993, when the Fortune 500 turnover average 290 companies per decade, above 50%. About 29 per year. 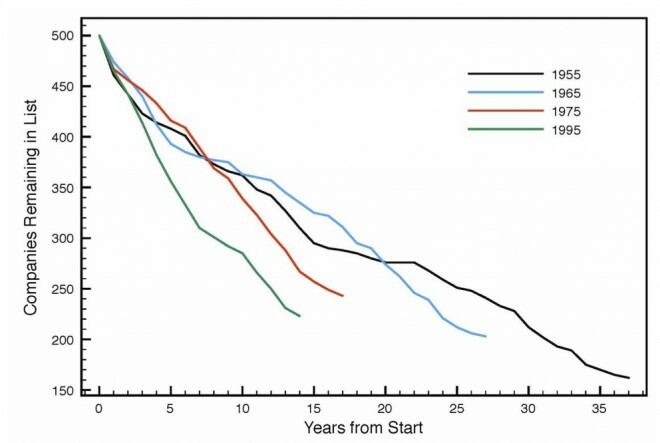 From 1995 to 2011 the average turnover increased to 390 per decade, at 78%, well above 50%, for an easy math result of about 39 per year. The chart below shows the increase, decade-by-decade. … race you to the bottom. Last one there wins. The next chart, reprinted from a Wired Magazine brief, shows a more in-depth year-over-year picture. … don’t turn your engine off, dear boy, you won’t be staying long. Is this purely a culture issue? I could make a case, yes. Culture is resilience, culture is staying power over competing values and ability to integrate diversity and innovation to keep those who become delusional on the straight and narrow. Also, is not the mantra of business schools worldwide: maximize shareholder return? How does falling off the Fortune 500 maximize shareholder return, whether a leverage buyout, a merger & acquisition, or otherwise? Despite the business school cabal behind maximize shareholder return, I argued on both sides of the Atlantic in my business school, that shareholders buy and sell a company to ring profit for themselves: short-term squeezes, at times, at the cost of the firm. And if you look at stakeholders, not shareholders, you include employees in the equation, and if you replace shareholder returns with stakeholder potential the goal becomes: maximize stakeholder potential. It is in stakeholder potential you meet both shareholder needs as well as employee and investor commitment. So, what is the cost of culture, if not the cost of shareholder return and stakeholder potential. It is a good read. I appreciate getting found. Though when you read the report, I am not necessarily cited in a positive light.